The Pomplamoose isn’t going extinct anytime soon | Do the twisted. Youtube sensation, Pomplamoose, is making waves across the internet through the viral presence of their “VideoSongs.” San Fransisco Bay area couple, Jack Conte and Nataly Dawn, started using the term “VideoSong” to describe their innovative music video style that is both quirky and creative. By recording and videotaping every instrument, voice, or sound separately and compiling them through editing software, the viewer gets to see and hear everything happening within the song. Straight Twisted right? Check out this segment from G4TV’s “Attack of the Show!”for more background on the duo. 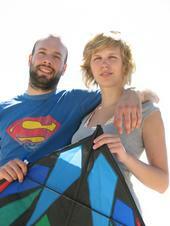 Pomplamoose, Youtube Stars! One of my personal favorite’s was a birthday present to Nataly’s dad where they customized an Earth, Wind and Fire song for his birthday. Now that’s what I call a music video, or should I say Video Song? Loved seeing grandma dancing, and the music is great. Thanks for posting this!